This plot starts before midnight on 30 September. The interesting feature is how the F layer disappears at about 1930 on the 1st October - the result of a severe magnetic storm. The fade-out also messed up a Doppler run today which involved G0HNW and G3CWI transmitting 1 Hz apart, with myself and M0GEB receiving. The idea is to compare the Doppler wobbles in order to study the vertical wave motion in the ionosphere. Ideally we need four stations in a square ABCD, with transmitters at A and C and receivers and B and D, but today's attempt was just to see if we could see anything useful at all in spite of the fact that the path geometries were not ideal, with M0GEB being too far away and getting "qrm" from the E-layer. 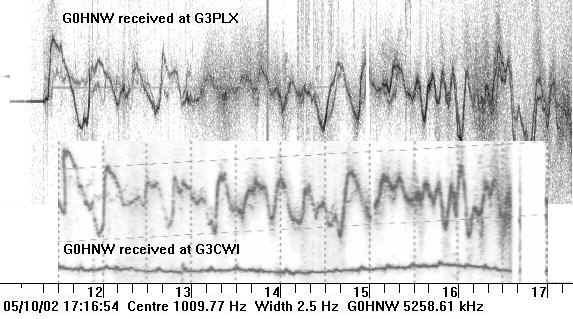 With last night's storm still subsiding at the start of the run, M0GEB was getting nothing and I was only getting very weak groundwave (10dB SNR in 25mHz bandwidth) from G3CWI and G0HNW (both at about 125km). The band recovered slowly after the Fcrit rose, and there's a good section in the afternoon where it's possible to see that the two paths give partially de-correlated Doppler wobbles. The next task is to find four volunteers with stable receivers/transmitters located in a 100km square! Interestingly the traces above correlate almost exactly in time showing that the wave fronts passed through the midpath points for both paths at the same times. This run was done with one transmitter (Huddersfield) and two receivers (Kendal and Macclesfield). This time a delay of about 11 minutes can be seen, with the waves passing between Kendal and Huddersfield first and between Huddersfield and Macclesfield 11 minutes later. The bottom fairly flat trace is a calibration signal that was used to correct for drift in my receiver - it drifted about 800mHz in total throughout the day.